I spotted some Brindisa cooking chorizo in my local deli last week and picked it up without having a definite plan for it. It’s been calling to me every time I open the fridge and today, with nothing else planned for dinner, it was a welcome addition to the fridge. I started wondering how it would work with lentils but a quick search online didn’t throw up anything interesting. A friend came to the rescue with a recipe not unlike the lentil ragu we’ve cooked before so I took some elements from both. Gently fry off the chorizo until browned and remove from the pan. In the same pan, sweat the onions with some salt until soft, add the garlic and chilli and cook for a further minute. Next, stir in the paprika and the lentils and make sure everything is well coated. Add the rest of the ingredients (including the reserved chorizo), bring to the boil, reduce heat and cook for 45 minutes. We ate this with toast which worked well but wasn’t entirely necessary. We both enjoyed it but I think the amendments I’ve noted above would definitely improve the dish. Subscribe to comments with RSS	or TrackBack to 'Spicy Lentils with Chorizo'. Cooking this tonight to reheat tomorrow for a starter ‘tapas style’. from what I’ve tased already ( whoops must leave some for tomorrow) very tasty. I’m glad you liked it, Emily. Hope the tapas worked out well. I tried this recipe today and loved it! 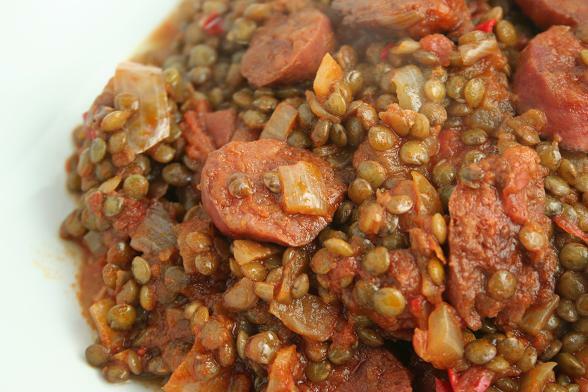 Me and my husband were watching Rick Stein the other night and he mentioned lentils with chorizo. I googled the recipe and your blog came up first. Simple and easy! I have just one remark: you never mentioned skinning the chorizos.The skin turns into plastic when you cook it and can be very unpleasant. Gladly I know that from previous experiences as we use chorizo a lot at home! Congratulations! Food lovers will be lucky to find this this blog and I am spreading the word!